smitRem is a free stand-alone tool designed for removing widely spread parasites. This utility identifies and eliminates corrupt illegally distributed spyware removers, fake video codecs, malicious web browser add-ons, numerous downloaders and trojans that the mentioned threats drop. smitRem is not a typical anti-spyware. It does not scan the system for all known parasites that advanced spyware removers search for. 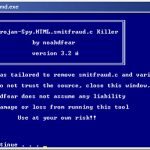 This tool is just a small collection of command files and third-party utilities suitable for removing only one single type of infections – the Smitfraud malware and its variants. RunThis.bat is the tool’s main file. It contains specific commands and calls other smitRem components. Once executed, RunThis.bat starts scanning the system for malicious registry keys, harmful processes, infected files and folders. 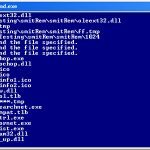 When it finds the infection, smitRem eliminates the threat by uninstalling malicious software, deleting related objects and replacing affected system files with clean copies. The scan usually does not take more than a minute. The removal process is also not too long. Although smitRem does not have any modern graphical interface, it can be easily used even by inexperienced users. The tool provides basic, but yet quite user-friendly text mode interface, which is used mostly to inform about what smitRem is doing at the moment – the tool doesn’t need much of user input and works automatically. smitRem is absolutely free. Its code is open and easily readable for everyone, who has some knowledge in system commands. The official web site is noahdfear.geekstogo.com. 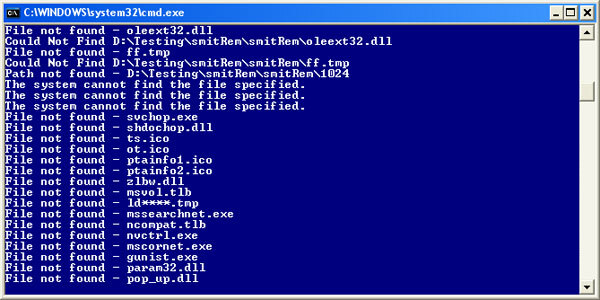 Please note that smitRem is not a full-scale spyware remover. It is a stand-alone tool that removes only several known parasites and therefore cannot replace a powerful anti-spyware product. This entry was posted on 2014-05-11 at 03:09 and is filed under Parasite removal tools, Software.